So fun going through emails and finding pictures of special times shared with pilgrim friends. 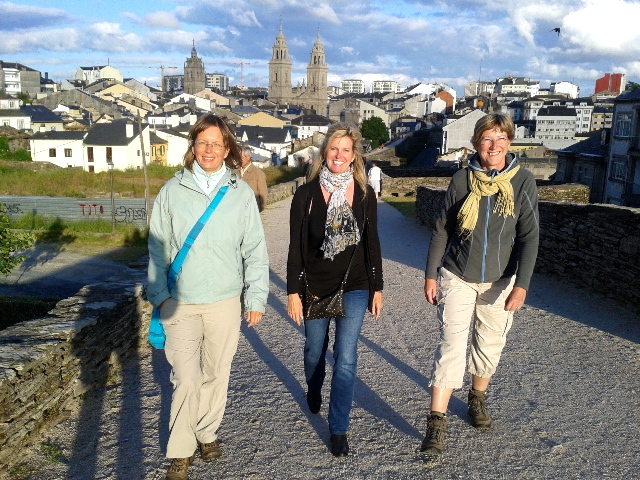 Such was the day, more than a year ago, when my German friends, Sabine, Marie, and their husbands Michael and Theo, went for a walk on the Roman Wall in Lugo – There’s something different about this walk when you think that you are walking around a city that dates back to 13 BC. You can just picture the Roman soldiers marching and everyone in roman dress and actually we get to have that more authentic and real life experience in June when Lugo celebrates its famous Arde Lucus – Romana and Celta Festival. But for now I am remembering walking this beautiful wall with friends I met on the Camino who were willing to change there plans and come and visit me for a couple of days. After a great Galician style meal which is known as the “Menu del Dia” or Menu of the Day served all over Galicia and along the route of the Camino is famous and a tradition that I have come to truly enjoy. The “Menu del Dia” is more food than you really need but it is always fresh, local, and traditional. It consists of two plates a starter and a main course and dessert served with bread and a bottle of wine. So what better way to spend the afternoon than to take a walk on the roman wall, the only fully intact roman wall in the world, and enjoy with pilgrim friends this ancient and historic town taking in some of the architecture and beautiful Galician countryside. I think it is time to enjoy this more often. Thank you Sabine, Michael, Maria, and Theo for a very special Camino Primitivo memory. This entry was posted in Camino Stories & Syncronicities and tagged architecture, camino, Camino Gratitude, Camino Stories, culture, history, The Way, traditions. Bookmark the permalink.